Many Americans eat corned beef and cabbage for St. Patrick’s Day, but this festive dish does not come from Ireland's holiday menu. 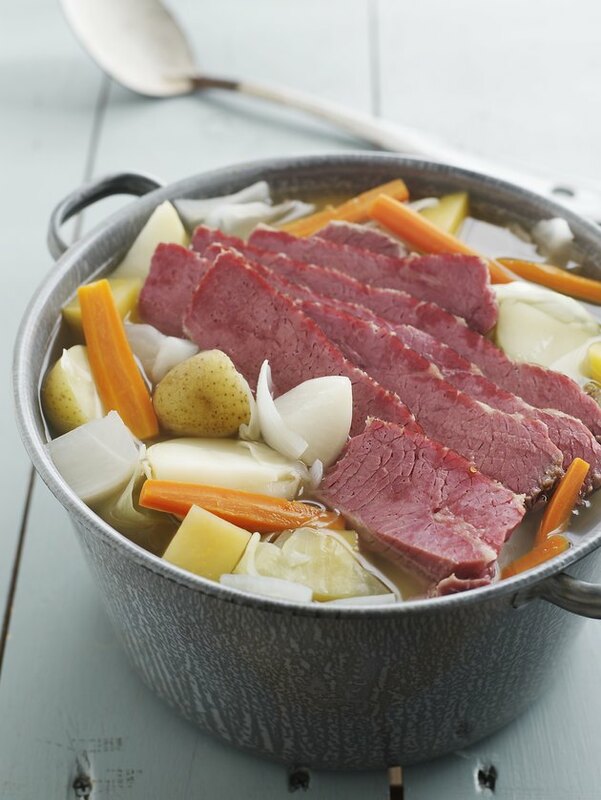 According to the University of Florida Health Communications, corned beef and cabbage began as an Irish-American tradition in the early 1900s. Most people can enjoy this holiday meal as a once-a-year treat, but healthy eaters should keep a few concerns in mind before making this dish a regular part of their menu. According to the U.S. Department of Agriculture's National Nutrient Database, a 3-ounce portion of cooked corned beef contains 213 calories, 15 grams of protein and 16 grams of fat. Of those 16 fat grams, 5 grams come from saturated fat, the type of fat that raises blood cholesterol and increases heart disease risk. The publication "Dietary Guidelines for Americans, 2010" recommend that adults consume less than 10 percent of their total calories from saturated fat. Each gram of fat equals 9 calories, so a person following an average 2,000-calorie diet should consume no more than 22 grams of saturated fat a day. Eating just 3 ounces of corned beef, approximately the size of a deck of cards, provides 23 percent of the daily recommended saturated fat intake for a 2,000-calorie diet. Corned beef is a cured meat, so it is also high in sodium. A high-sodium diet increases your risk for hypertension, stroke and heart disease, and the Institute of Medicine recommends adults limit their intake to 2,300 milligrams of sodium a day. A 3-ounce serving of corned beef contains 827 milligrams of sodium, 36 percent of the Institute of Medicine’s daily recommendation. Even if you do not have risk factors for high blood pressure or heart disease, limit your intake of corned beef to special occasions. A 2010 study by the Harvard School of Public Health found that people who ate processed or cured meats regularly had a 42 percent higher risk for heart disease than people who consumed these meats infrequently. Low in calories and high in vitamins, cabbage provides a tasty and nutritional addition to your festive Irish meal. One cup of cooked cabbage contains only 34 calories and virtually no fat. A high-fiber diet helps to control cholesterol levels, stabilize blood sugar and promote healthy digestion. One cup of cabbage provides 3 grams of fiber, between 7 percent and 12 percent of the 25- to 38-gram daily recommendation for adults. Cabbage contains high levels of vitamin C, an antioxidant vitamin that promotes a healthy immune system, and 1 cup of cooked cabbage provides nearly double the daily recommendation of vitamin K. Your body needs vitamin K for blood clotting, but people who take blood-thinning medications should limit their intake of foods high in vitamin K. If you take a blood-thinning medication, talk to your doctor before eating cabbage with your meal. Cabbage makes a low-calorie side dish, but some cooking methods are healthier than others. According to Harvard Medical School’s Family Health Guide, boiling vegetables causes the water-soluble vitamins to leach out into the water, but microwaving or steaming veggies helps to preserve these nutrients. Butter adds saturated fat to your cabbage side dish, so substitute a heart-healthy fat, such as olive oil, instead. If you serve cabbage with corned beef, avoid adding extra salt to your cabbage dish. According to the Academy of Nutrition and Dietetics, 1 teaspoon of salt contains 100 percent of the daily recommendation of sodium for a healthy adult. Eliminate the salt and flavor your cabbage with your favorite low-sodium seasonings, such as black pepper, red pepper, garlic and bay leaves. Can I Cook Cabbage, Potatoes & Carrots Separately From Corned Beef?